Trade Facilitation, entailing reduction in the transaction time and cost through rationalization of documentation and border compliances in trading across borders, has been one of the major areas of reform of the government of India over the last few years. Implementation of the WTO’s Trade Facilitation Agreement (TFA) from February 2017 has provided further momentum to this initiative by mandating introduction of reforms to expedite the movement, release and clearance of goods and promoting effective cooperation between the authorities of the trading partners. Some of the major reforms in the area of Trade Facilitation include introduction of an online Single Window Interface for Facilitating Trade (SWIFT), the revamped Authorised Economic Operator (AEO) programme, the Integrated Risk Management System (RMS), the Direct Port Delivery (DPD) facility, and several other initiatives. These reform measures have started yielding results for stakeholders at the ground level. For instance, the dwell time for imports at the Jawaharlal Nehru Port Trust (JNPT), Mumbai, has come down from 181.30 hours in January 2017 to 144.18 hours in January 2018. The government aims to reduce the dwell time further to 72 hours shortly. We expect India to record a sharp improvement in its Trading Across Borders ranking in the next Doing Business report of the World Bank, which is due later this year. Currently, the country is on the 146th position (out of 190 economies). For sustained improvement in the ranking, it would be essential that the momentum of reforms is maintained and pending issues are resolved expeditiously. This article attempts to capture key reforms introduced by the government, which have started yielding positive results for all stakeholders, including industry. It also makes recommendations for further improvement in Trade Facilitation, besides mentioning a few key initiatives of CII in supporting the implementation of reforms. The documentation requirements for exports and imports have been rationalised from 7 and 10, respectively to 3 each, thereby, reducing the transaction cost significantly. In April 2016, the Central Board of Indirect Taxes and Customs (CBIC) embarked on the journey of paperless imports by introducing SWIFT to facilitate a single point interface for customs clearances. The facility was later extended to exports from January 2017. The system integrates 9 separate forms required by 6 Partner Government Agencies (PGAs) and has done away with the requirement of importers seeking approvals from multiple government agencies for their consignments. The revamped Authorised Economic Operator (AEO) Programme is a merger of the earlier Accredited Client Programme (ACP) and the AEO programme with the objective of providing businesses with an internationally recognized quality mark. The key advantages of the revamped AEO programme include benefits of Mutual Recognition Agreements (MRAs), paperless declarations with no supporting documents and deferred duty payments, among others. The government has also introduced an Integrated Risk Management System (RMS), which allows customs officials to single out suspicious cargo based on pre-determined risk parameters like the country of origin, importers track record, etc. For low risk consignments, the requirement of seeking NOCs from 6 PGAs has been waived off. As a result, over 80% of the consignments are cleared without physical inspections at many major ports/customs. The facility of Direct Port Delivery (DPD) allows delivery of containers to the consignees, instead of waiting in the Container Freight Station (CFS) for clearance of cargo. This has reduced the average dwell time for DPD customers to 36 hours and the expenses by Rs 8000/ – Rs 20,000/ per container. Approximately, 39% of the cargo is currently being cleared under the DPD facility at JNPT. On the export front, the majority of traders are now availing of the Direct Port Entry (DPE) facility, which allows entry of factory stuffed containers to a CFS or port through the parking plaza. After verification of the container number, the seal number and the integrity of the seal, when the goods are presented for registration to customs, the RMS indicates whether or not to examine the goods. First, the government has implemented the Port Community System (PCS) with the objective of integrating the electronic flow of trade related documents/information and functioning as the centralised hub for the ports of India and other stakeholders like Shipping Lines/Agents, Surveyors, Stevedores, Banks, CFS, Customs House Agents, Importers, Exporters, Railways/CONCOR, Government regulatory agencies, etc., for exchanging electronic messages in a secure manner. 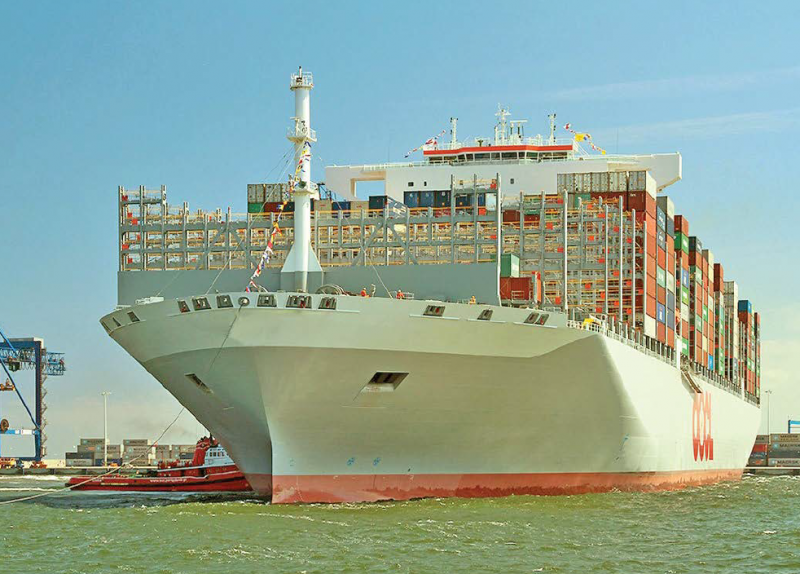 Second, the use of RFID is being adopted across all major ports to reduce the overall time taken for container movement and to reduce the transaction costs. JNPT, for instance, has launched the Logistics Data Bank wherein a Radio Frequency Identification (RFID) tag will be attached to each container which can then be tracked through readers installed at different locations. This move is targeted to promote speed, visibility and transparency associated with container movement. At JNPT, this has helped in eliminating the need for manual verification and facilitated the reduction in transaction time from 5 minutes earlier to less than a minute now. Third, the CBIC has made it obligatory to upload supporting documents through e-SANCHIT for all Bills of Entry (BoE) filed. This is significantly helping in facilitating easier submission of trade related documents on the ICEGATE portal electronically. Fourth, the use of e-Delivery Orders, e-Payments and e-Invoice has been made mandatory at major ports for all stakeholders in the maritime trade. Fifth, with the objective of complying with international safety standards, ports in India are being encouraged to install Radiological Detection Equipment (RDE) for screening containers. JNPT became the first major port to install RDE at Road and Rail Gates. Sixth, the CBIC has implemented electronic sealing for containers by exporters under the self-sealing procedure. This has simplified the procedure for factory stuffing under the Central Excise Officers. In a significant move for facilitating trade, the government has set up a high-level Customs Clearance Facilitation Committee (CCFC) at every major Customs under the Chairmanship of the Chief Commissioners of respective Customs. The Committee ensures and monitors the clearance of goods for imports and exports in accordance with the timeline specified by the parent Ministry/Department. Further, the government has also constituted the National Committee on Trade Facilitation (NCTF), chaired by the Cabinet Secretary to suggest the pan-India road map for Trade Facilitation. CII has been supporting the government in the implementation of reforms in trade facilitation in numerous ways. Some of the key initiatives in this direction are mentioned below. 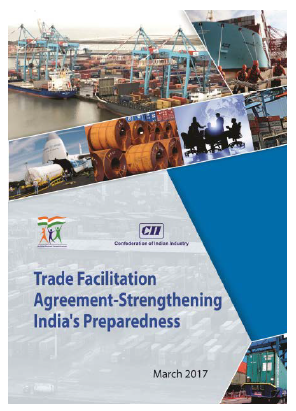 With an attempt to ensure effective implementation of the Trade Facilitation Agreement (TFA), CII undertook an exhaustive study based on primary and secondary sources of information, to provide its recommendations to the government. The study was released by the then Chairman of CBIC and many of its recommendations were considered positively by the government. 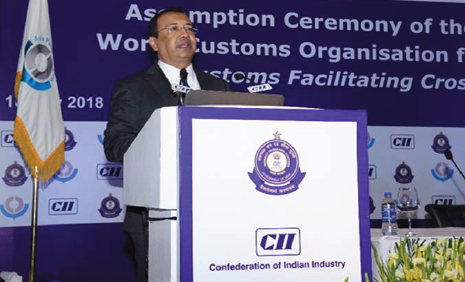 CII, in partnership with the CBIC, Ministry of Finance, Government of India, and the World Customs Organization (WCO), organised an international Conference on “Customs Facilitating Cross Border Clearances” on 16 July 2018 in New Delhi, which saw participation from 33 Asia Pacific Countries. The Conference marked India assuming the office of the Vice-Chair of the Asia Pacific Region of WCO for the next two years. Several dignitaries such as Mr Shiv Pratap Shukla, Minister of State for Finance, Government of India; Dr Kunio Mikuriya, Secretary General, WCO; and Mr S. Ramesh, Chairman, CBIC, spoke at the Conference. The Conference provided a platform to share international best practices in the area of Trade Facilitation. CBIC mentioned a series of reforms undertaken by India such as e-Sanchit, the Authorised Economic Operator Programme, e- Sealing of Containers, among others. Adding the corporate perspective to Trade Facilitation reforms in India, CII took the opportunity to highlight the industry perspective on some of the key reforms introduced by the government in the sphere of Trade Facilitation. A few other countries including South Korea, Australia and Singapore mentioned the good practices followed in their countries. CII has also been organising a series of Conferences and workshops on Trade facilitation in various cities of the country to create awareness about the newly implemented reforms, and invite feedback on the same, as well as pending areas of reforms. In collaboration with CBIC, it organised Conferences on Trade Facilitation in Bangalore, Mumbai and Delhi. These Conferences provided a platform for stakeholders, including policy makers and industry, to discuss the recently introduced reforms, best practices across ports/customs and the pending issues. The government of India has been assiduously introducing a range of policy reforms in Trade Facilitation, which have started yielding results for stakeholders in the trading ecosystem. Transaction costs are coming down significantly across all major ports and customs. Given that there is still a long way to go before India joins the league of the top 50 nations in the Doing Business Report of the World Bank, it is important that the reform momentum is sustained. Ensuring paperless and timely clearances of goods at all ports/customs.